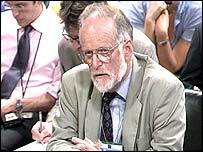 MPs reacted with shock and disbelief when it emerged that a body had been found in the search for missing Iraq weapons expert, Dr David Kelly. They said their thoughts were with Dr Kelly's family after the discovery in Oxfordshire. Many of the MPs on the foreign affairs committee have said the scientist was not used to the political and media spotlight which had fallen on him in recent weeks. Speaking on Friday, Conservative leader Iain Duncan Smith said: "I was deeply saddened to hear the news today of the tragic death of Dr David Kelly. My thoughts are with Dr Kelly's family. They have our deepest sympathy. "We must all have respect for David Kelly's family given the terrible shock they have had today. "Of course, there will be many questions arising from these events but now is not the moment for me to comment on the implications of this dreadful news." Mr Duncan Smith welcomed the MoD inquiry which had been announced, but said it should be a full public judicial inquiry. He also suggested Mr Blair should return early from his diplomatic trip because of Dr Kelly's death. Liberal Democrat leader Charles Kennedy also offered his deepest sympathies to his family. Former minister Peter Kilfoyle said: "Our first thoughts have to be those of sympathy for Dr Kelly's family. "This adds another bizarre twist to this whole ongoing soap drama which is the weapons of mass destruction excuse for going to war with Iraq. "We don't know exactly what Dr Kelly's own frame of mind was in the build-up to his appearance before the select committee. We don't know what his immediate reaction was to the cross-examination. "I think it just underlines that need to take this into a different realm and have an independent inquiry into these issues." "People would have more faith in the ability of an independent inquiry chaired by a judge than they would in any number of parliamentary committees." Tony Blair's spokesman has now said there will be a judicial inquiry into the circumstances surrounding Dr Kelly's death. Committee chairman Donald Anderson told BBC News 24: "It looks very tragic indeed. It shows the human consequences and puts much of that has been done recently into perspective." Mr Anderson said Dr Kelly had come across as someone rather relaxed before the committee. "There was some suggestion he might have someone alongside him to give him confidence but he rejected that," he said. "He seemed on top of it." John Maples, a Conservative member of the Foreign Affairs Committee, said: "There must be more to this than we had thought. I do not know what that means, I just think there is. Speaking before the BBC confirmed that Dr Kelly was its principal course for the controversial report, the MP said: "When he came to give evidence, obviously he would rather not have been there. But it must have been clear to him, as it was to us, that he wasn't the guy. "In fact, several people (on the committee) said 'you have been used by the government'. "I would have thought he would have gone away from that meeting feeling better, feeling at least 'I am in the clear with these guys'." His fellow Tory committee member Richard Ottaway said people like Dr Kelly were not used to the pressure faced by MPs on a day-to-day basis. He said it would be a "tragedy of ghastly proportions" if "political machinations" had resulted in the death of Dr Kelly. "He did give a hint of the pressure he was under when he said he was unable to get to his house at the moment because of the media intrusion," he said. "He is not used to the media glare, he is not used to the intense spotlight he has been put under." Labour committee member Gisela Stuart, said the news about Dr Kelly was tragic and thoughts should be for his family. "There is a huge danger at this stage of making a mistake and falling into either quick judgements or starting to play party political games," she added. 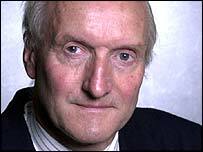 Another Labour committee member Eric Illsley told BBC News 24: "I would not have thought that simply appearing before a select committee on this issue would be sufficient for him to take the actions that he has done." Lib Dem committee member David Chidgey said he thought the MPs had questioned Dr Kelly "firmly and fairly". Television journalist Tom Mangold, a close friend of Dr Kelly, said he had spoken to the official's wife, Janice. "She told me he had been under considerable stress, that he was very very angry about what had happened at the committee, that he wasn't well, that he had been to a safe house, he hadn't liked that, he wanted to come home," Mr Mangold told ITV News. "She didn't use the word depressed, but she said he was very, very stressed and unhappy about what had happened and this was really not the kind of world he wanted to live in." Mr Mangold said he wanted the BBC to come forward with the "full story" so he could feel he had not made a mistake in introducing Dr Kelly to journalism. "Party leaders say it's right there should be an investigation"